How are proteins in the cells of a flowering plant similar to social networks on Twitter or Facebook? And how might both of those be related to the way pathogens make plants or people sick? Shahid Mukhtar, Ph.D., and colleagues at the University of Alabama at Birmingham address these questions in a collaborative study with researchers at the Gregor Mendel Institute, Vienna, Austria. Using systems biology, they successfully identified previously unknown protein targets of plant pathogens in the flowering plant Arabidopsis thaliana, employing some of the same methods used to analyze social networks or biological networks. Their theoretical framework, they say, could help analyze other interactions between species to reveal pathogen contact points. In a social network, one can map the connections between followers or friends on Twitter and Facebook. A few people will have a huge number of connections, some will have many, and a vast majority will have much fewer. A map of these connections is akin to an airline route map, and the architecture of the networks shows topological features like hubs and bottlenecks. Analysis of social networks has allowed experts to identify people who are the "best information spreaders." Similarly, for biology, deciphering the network architecture in an ecosystem or among macromolecules within cells of a lifeform can help discover novel components in those complex systems and provide biological insights and testable hypotheses. One biological network is protein-protein interactions inside cells. Such networks have been studied in organisms as diverse as plants, humans and roundworms. A network map of those protein-protein interactions, which signify proteins' operating in conjunction with other partners, is called a protein interactome. 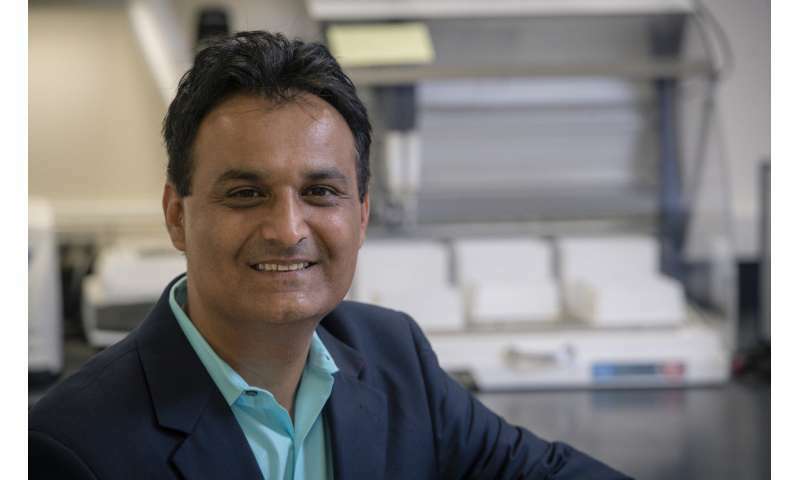 In a study published in Nature Communications, Mukhtar, an assistant professor in the Department of Biology, UAB College of Arts and Sciences, together with colleagues at UAB and the Gregor Mendel Institute, analyzed two different interactomes. The first one is the global protein interactome for proteins inside leaf cells of the model plant A. thaliana, called the Arabidopsis interactome. They also analyzed another, more specific protein interactome for receptors on the cell surface that allow plants to see, hear, smell and respond to environmental cues and dangers—especially to virulent pathogens. This second network is called cell surface interactome. For the proteins inside cells, they first matched more than 4,300 Arabidopsis protein-coding genes to five classes of observable traits, known as phenotypes. The five phenotype groups were essential genes that are needed for plant survival; morphological genes that control a plant's shape or appearance; genes for cellular or biochemical processes; conditional genes, where a mutation shows its effect only when the plant is subjected to stresses like water shortage or temperature extremes; and genes with no known phenotype. When they associated the phenotypes with a protein interactome network they had previously mapped, they found the large hub and bottleneck nodes were enriched for conditional phenotype genes and depleted for essential genes. This contrasts with the controversial centrality-lethality rule seen in yeast protein interactomes, where the large hub and bottleneck nodes are enriched for essential genes. Pathogens of Arabidopsis are able to inject pathogen proteins into the plant cells, and those injected "effector" proteins manipulate the plant's network to the pathogen's advantage. Mukhtar and colleagues had previously constructed two interspecies plant-pathogen interaction networks between pathogen effector proteins and Arabidopsis proteins inside the cell. The team found that large hubs in the Arabidopsis interactome comprised only 6.5 percent of the targets of the pathogen effector proteins, which made it a limited way to identify targets using network biology. But when the researchers applied a method called weighted k-shell decomposition to identify the best "information spreaders," akin to recent analysis of social networks, the Arabidopsis protein nodes in the internal layers of the k-shell decomposition gave a 33 percent discovery rate for pathogen effector targets. Thus, k-shell decomposition analysis surpasses other centrality measure for effector target discovery. To test this, they then looked at an unrelated network, the cell surface interactome. These cell-surface proteins allow plants to sense the environment around them. The k-shell analysis predicted that 35 of these cell-surface proteins were the most influential spreaders of information. When the internal portions of the cell-surface proteins were tested for interactions with effector proteins from the bacterial pathogen Pseudomonas syringae, the researchers were able to identify seven previously unknown effector targets, a discovery rate of 40 percent. The researchers made mutants of the seven effector targets and found that all of the newly identified targets showed changes in pathogen growth on Arabidopsis plant leaves when mutated. "Our network-centric approach," the researchers wrote, "has exciting potential applicability on diverse intra- and inter-species interactomes, including human protein-protein interaction networks, in efforts to unravel host-pathogen contact points, while fostering the design of targeted therapeutic strategies."